Early and excellent setting. Good H shape and semiwhite color are good for fresh market. Long shelf life. High yield. 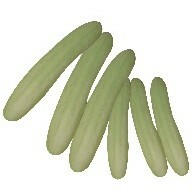 The unique greenish white cucumber offers high yield, multiple fruits per node. 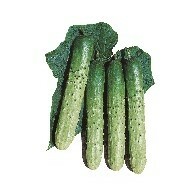 Fruit 25~30cm in length and average weight of 450g, 4~5cm in diameter. Uniform fruit size and vigorous plant during whole growing stage. Vigorous plant with short internode. Semi white skin color fruit with white spines and good storaging ability. Very uniform and excellent taste with succulent flesh. Resistant to powdery mildew and downy mildew. 20~22cm in length, fast enlargement, good fruit setting. 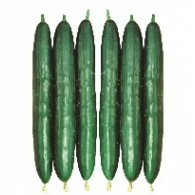 Deep green coloured cucumber has firm texture and strong to cold. Medium fruit size about 22-24cm in length. Fruit elongation is fast. Fruit is deep glossy green with white spines. The fruits are crisp and flesh is slightly tender. Good fruit setting on ain and lateral branches. Heat tolerance and resistant to downy mildew. Vigorous plants produce light green cylindrical and uniform fruits. Good fruit setting and excellent long shelf life. The flesh is crisp with less bitter taste. Fruits are about 22- 24cm in length, 4.5-5.5cm in diameter and 330-380g in weight. 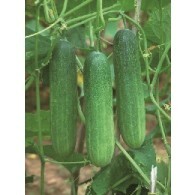 A cucumber variety with strong plant vigor. 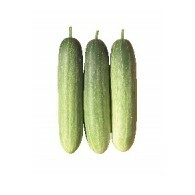 Fully matured fruit measures 19~22cm in length, 4~5cm in girth and 200~250g in weight. Its fruit shows great marketability with its smooth bright green colored skin. It takes 43~45 days to maturity as well. Heavy yielding and early fruit setting. Long shelf life for transportation and keeping. Fruit sizes are 4.0-4.5cm in diameter and 20-22cm in length. Fruit weight is 300-350g. It can be matured in 35days after sowing. Fruit color is light green. Very delicious and low bitterness with good taste. It is a variety yielding fruit that is high in sugar, thick flesh and crispy taste. In its early harvesting stage, fruit yields in an abundant rate helping growers to be profitable. Fruit weights heavy thus it is suit to pack in boxes. 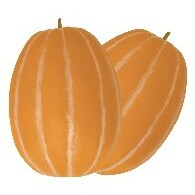 Oriental melon hybrid with fruit shape of “H”. Fruit skin color is yellow while its flesh is white and has good eating quality. Has good storaging ability and shows uniformity in its harvest. Oriental melon hybrid with strong resistance to Powdery Mildew. Fruit yield level is high especially during the cold season. Fruit is medium sized with short oval shape. Oriental melon hybrid with strong resistance to Powdery Mildew. Has strong vigor in the early stage of cultivation to increase yield of the fruit. Fruit size is medium while its shape is oval. Has firm flesh with high sugar content. rketable. 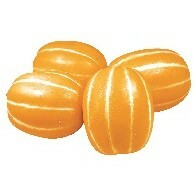 The fruit also has deep orange colored skin with white flesh. It also has outstanding taste with excellent flesh texture and sugar content measuring 13.8˚ on BRIX scale. High yield, especially in early stage. High sugar. Thick flesh and crispy taste. Rather big fruits and suitable to pack in box.